여수 흥국사 무사전에 봉안되어 있는 지장보살삼존상을 비롯한 시왕·권속일괄은 1648년(인조 26) 수조각승 인균(印均)을 비롯한 12명의 조각승들이 참여하여 조성한 작품이다. 지장보살상은 동그란 얼굴에 살이 적당히 올랐으며, 부푼 눈두덩 사이로 짧게 치켜 올린 눈이 인상적이다. 단정한 신체에 표현된 옷 주름은 강직한 직선과 부드러운 곡선을 잘 조화시켜 신체의 굴곡과 양감을 잘 살려내었다. 시왕과 권속상은 그들이 지니고 있는 개성적인 특징과 역할을 다양한 표현력과 연출력으로 생동감 있게 묘사하였다. 흥국사 무사전 조각들은 17세기 불상 양식을 잘 반영하고 있을 뿐만 아니라 지장보살삼존을 비롯한 권속들이 모두 존속하고, 조성주체와 조성연대를 알 수 있는 발원문이 존재한다는 점에서 가치를 지니고 있다. 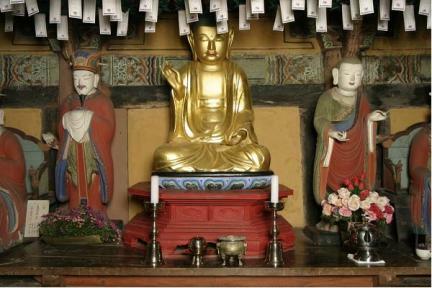 The Wooden Ksitigarbha Bodhisattva Triad and Ten Underworld Kings enshrined at Musajeon Hall of Heungguksa Temple in Yeosu were created in 1648 (the 26th year of King Injo’s reign), by 12 monk sculptors under the master sculptor Ingyun. The Ksitigarbha has an impressive expression on the fleshy round face, gazing upward from under swollen eyelids. The body is nicely curved with a sense of volume, enhanced by the pleasant harmony of the straight and bent lines of the folds of the robe. The Ten Underworld Kings and attendant figures have lively expressions, suggestive of their respective roles and different attributes. These sculpted images successfully reflect the Buddhist iconography of the 17th century. Their value is heightened by the existence of all the images carved together and a letter of invocation revealing the situation surrounding their creation.